Yesterday, GRC standout Jake Klim broke his silence on reports that he intends to stage a running comeback at the 2016 Marine Corps Marathon. Rather than issuing a confirmation or denial, however, Klim elected to play politics with the region's most beloved marathon by commenting only that the reports, first published by social media giant Facebook, were "unfounded." 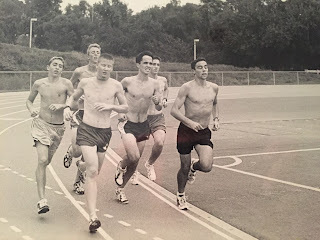 Notably, by criticizing the source of the rumors rather than issuing an outright denial, Klim (seen above performing hard training for an unidentified event which may or may not be the 2016 MCM) did not foreclose the possibility that the rumors were poorly sourced but nonetheless true. Indeed, reports of his preparation for MCM gained enough traction on social media to garner twelve "likes" and earned enough cache to migrate to the blogosphere, which would not have been possible without an evidentiary foundation. News Reporter and DC-area running insider Charlie Ban described the story as "developing." Stay tuned to this blog for any breaking news on Klim's intentions. Its time for Clubs Clubs Clubs!